The type of lung cancer you have will determine which treatments are recommended. 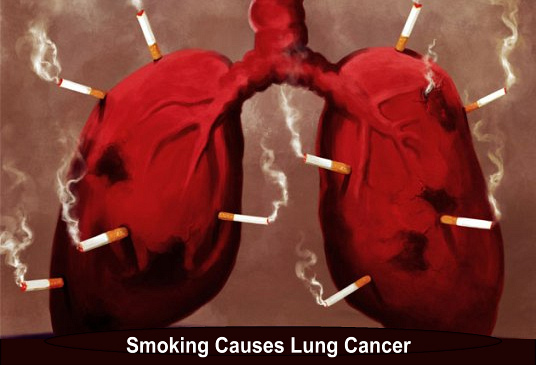 Although people who have never smoked can develop lung cancer, smoking is the main cause. Cigarette smoking is solely responsible for over 90 per cent of all lung cancers. The risk is directly proportional to the number of cigarettes smoked and the number of years smoking has occurred. There is increasing evidence that passive smoking - the inhalation of other people's cigarette smoke by non smokers increases the risk of developing lung cancer by over double. Lung cancer unrelated to smoking affects mainly older people. Non-smoking related lung cancer is rare in people younger than 40. Non-smoking related lung cancer is most commonly diagnosed in people aged 70-74 years. Other rarer causes include environmental and occupational factors such as exposure to radon gas or certain types of radiation. • 1. A bronchoscopy. This is where the lungs are examined using a flexible fibreoptic telescope. Any blockages or growths in the lungs can be seen, and biopsies (small pieces) taken for analysis to confirm a diagnosis. • 2. Percutaneous needle biopsy. Here, a very fine needle is guided into the tumour under X-ray guidance in order to obtain the biopsy. • 3. Body scans such as CT or MRI scans may be used to assess both the exact size of any tumour and whether it has spread to any other part of the body. • Chemotherapy. Here, very strong anti-cancer type drugs are given in hospital directly into a patients veins, usually in a chemotherapy department. This takes the course of repeated daily infusions, with the patient usually being allowed home each day after treatment, with a number of courses being separated by a period of several weeks. 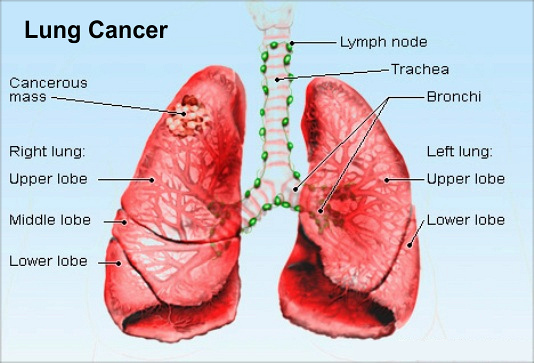 Small cell types of lung cancer are often treated in this way. Hair loss is a common side-effect of this treatment type, along with nausea and sickness. Patients also have their blood regularly checked since they are more prone to developing infections during a course of chemotherapy - any such infections are rapidly treated with antibiotics. • Radiotherapy, or 'X-ray treatment'. This is often given each day for between 3 to 6 weeks. It is a good way of shrinking down lung cancers which cannot be operated on, or after surgery to try to prevent it recurring. Side effects here include soreness (rather like sun burn) at the area, sickness or diarrhoea, and a loss of appetite and weight. These symptoms usually clear quickly once the treatment is stopped. • Surgery. This tends to be done only in patients fortunate enough to have had their cancer detected early. 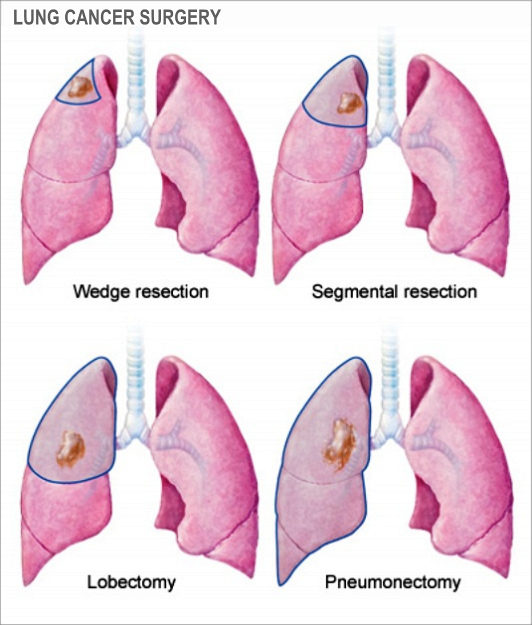 The patient needs to be strong enough to withstand such major surgery, and the cancer needs to be removable - usually as part of a lung taken out. This may then be followed by radiotherapy. Such surgery can cause considerable post-operative discomfort and breathlessness, which may take many weeks to settle. • Palliative treatment involves using a combination of drugs, radiotherapy and specialized nurses to control any symptoms - most of the symptoms of lung cancer can controlled to a very great degree with the right treatments. This depends entirely on your own particular circumstances. Do not be afraid to ask your doctor questions about this - they should be able to give you a detailed answer about your illness and their hopes for your treatment. As lung cancer does not usually cause noticeable symptoms until it has spread through much of the lungs or into other parts of the body, the outlook for the condition is not as good as many other types of cancer. Overall, about 1 in 3 people with the condition will live for at least a year after they are diagnosed and fewer than 1 in 10 people will live at least five years. However, survival rates can vary widely depending on how far the cancer has spread at the time of the diagnosis. Early diagnosis can make a big difference. Once lung cancer is diagnosed it is impossible to turn the clock back, but if you still smoke you should stop, even at this stage. This will give you a greater chance of success with your treatment, especially if you have had surgery with the intention of a cure. 1. How many do you smoke, and when did you start? 2. Are you coughing more than usual? 3. Have you coughed up any blood or dark-coloured spit? 4. Do you get short of breath easily? 5. Do you have any discomfort in your chest? 1. How quickly will I know if my treatment is working? 2. Will I need long-term follow up by the hospital? 3. When is a lung cancer patient able to say they are cured? 4. My children smoke. Are they more at risk of lung cancer? 5. Can I have any say in the choice of treatment for me?